Screen Grab: Matterport eBlast to MSPs sent Friday, 8 February 2019. 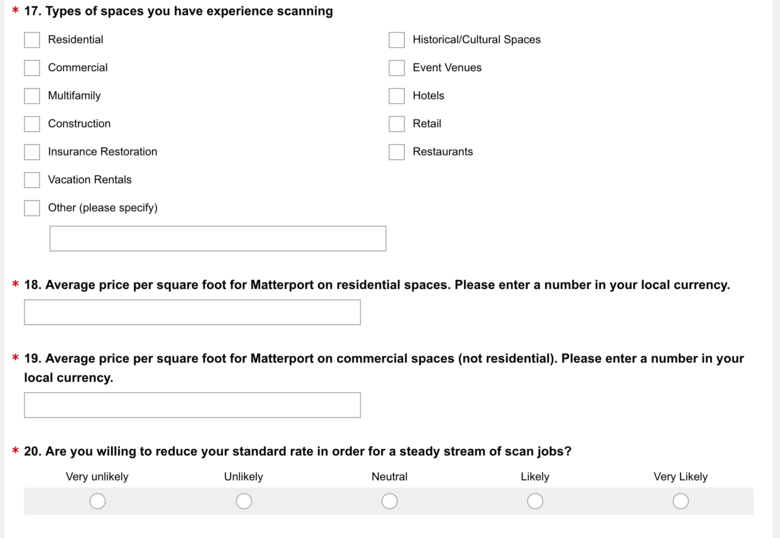 Before you complete this "Matterport Census" (below) - you might ask Matterport, "How will this information will be used to compete with me?" ✓ 20. Are you willing to reduce your standard rate in order for a steady stream of scan jobs? ✓ 21. 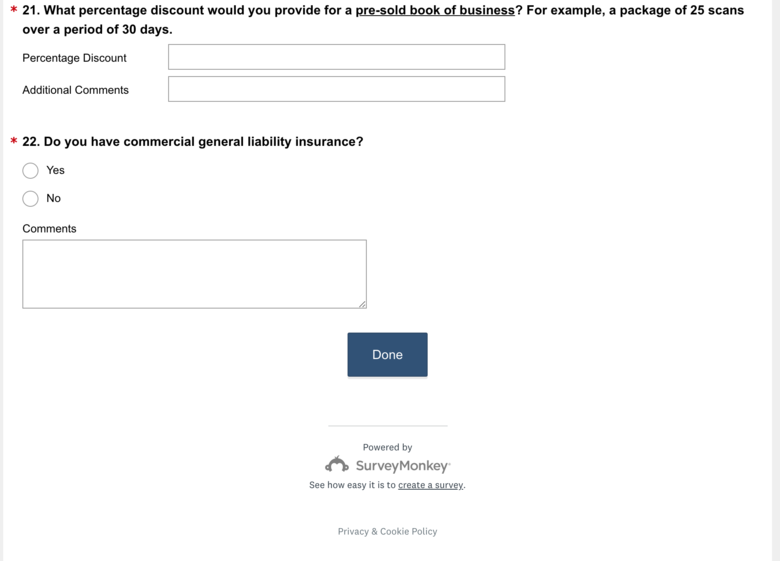 What percentage discount would you provide for a pre-sold book of business? For example, a package of 25 scans over a period of 30 days. Even if this does not interest you, imagine that you bought a Matterport Camera and that Matterport is asking all your competitors, how low will you go? And, then Matterport engages them to compete with you. I could imagine Matterport saying, "Well, this is business from multi-family home communities that individual Pros will never get on their own." Seems to me that Matterport should NOT be in the business of selling us a camera and then calling on our potential clients. Matterport, if you are interested in helping Matterport Service Providers get multi-family home shoots, help 3rd party photography agencies develop these channels. I'm okay with agencies seeking discounts from Pros in exchange for volume of business: not the company that sells us the camera. I was hoping that with a new Matterport CEO, we would see fundamental changes in how Matterport raises all boats. This survey will be used to sink ships. Matterport should be championing Matterport Service Provides getting the most money for our services. 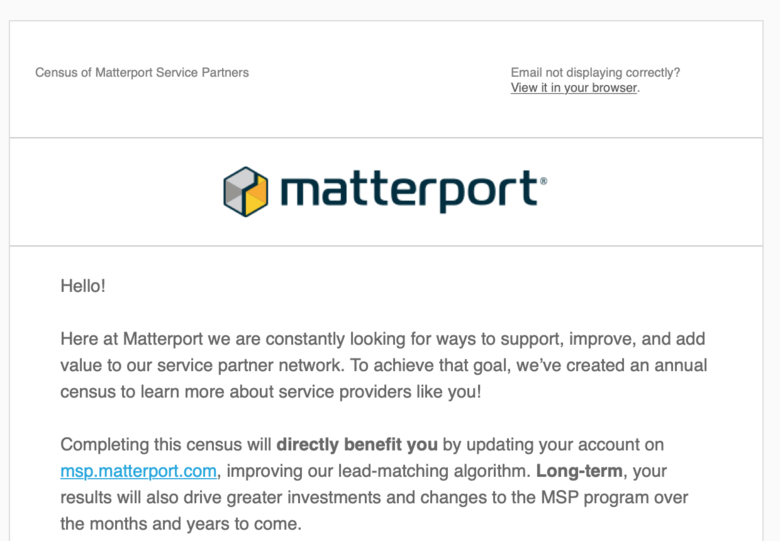 Instead, Matterport is likely paying the least amount per scan and using a "census" to help drive prices paid to Matterport Service Prices to even lower prices. 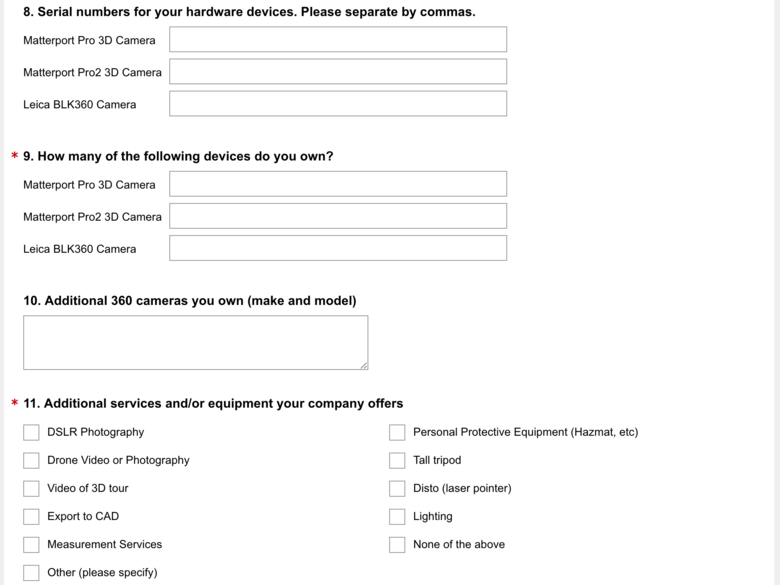 That's another great question to ask Matterport when they are trying to sell you a Camera. I could imagine that there is a huge difference between what Matterport Camera Sales Team tells prospective Matterport Pro what they can earn per scan and what Matterport is actually paying Pros. What are you thoughts? Is Matterport a Wolf in Sheep's Clothing? P.S. You might also ask Matterport if they will anonymize the data and share it with those that complete the survey. Wouldn't you like to know the answers too? ✓ Should Matterport be in the Business of Buying Scans from MSPs? ✓ Matterport Competing with Matterport Pros? ✓ Question of the Day: Is Matterport Multi-Family Group a Competitor? ✓ Matterport using your tours to sell Cameras to competitors? Screen Grab from Matterport "census"
@DanSmigrod - Thank you once again for your perceptive clarity on this issue which is so fundamental. No doubt MP hopes to one day become the default standard for 3D walkthroughs. In this pursuit, it’s essential to become as ubiquitous as possible, but this should be accomplished by by technological superiority, not selling their own offspring into slavery. Okay, maybe that’s a stretch, but I agree, this survey smells of sabotage. Hope I’m wrong. For me this Matterport MSP program has never led to any countable results. No valuable business leads from Matterport in the last 3 years. Therefore I think this so called "survey" is completely insane. Who do they think they are to ask those questions? Matterport knows my clients, because I have to host spaces with Matterport. And now they want to know my clients rates? For what? I think Matterport should better focus on the development of the software and on getting their platform out of beta (after almost 1 year). Matterport should better focus on being a great software company - Matterport will never be a great service company. Many people have received great leads from the MSP "Program". Many leads from the MSP "Program" are great leads. 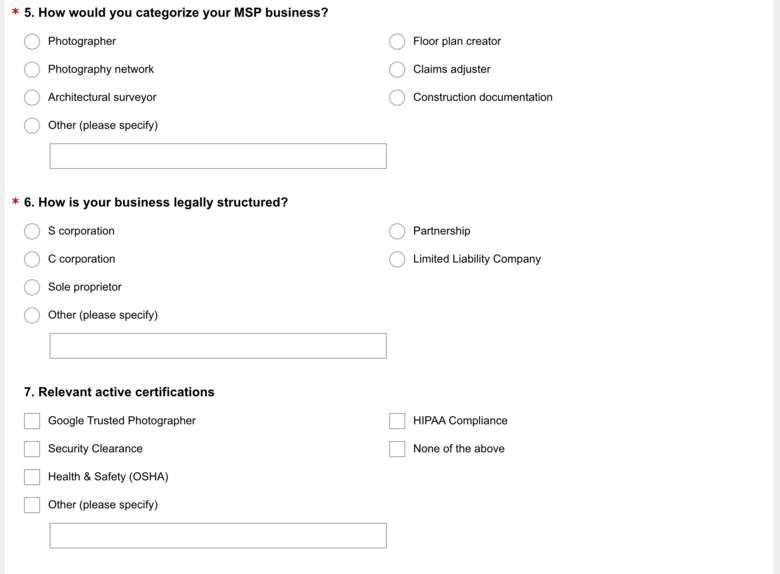 Most leads from the MSP "Program" are not great. Every person in the MSP "Program" has received many not great leads. Matterport has always had a CEO. It now has a new CEO. It also had someone who ran the MSP Program. It now has a new person who is going to run the MSP Program. Things are changing. I'm not sure that this survey is a wolf in sheep's clothing. 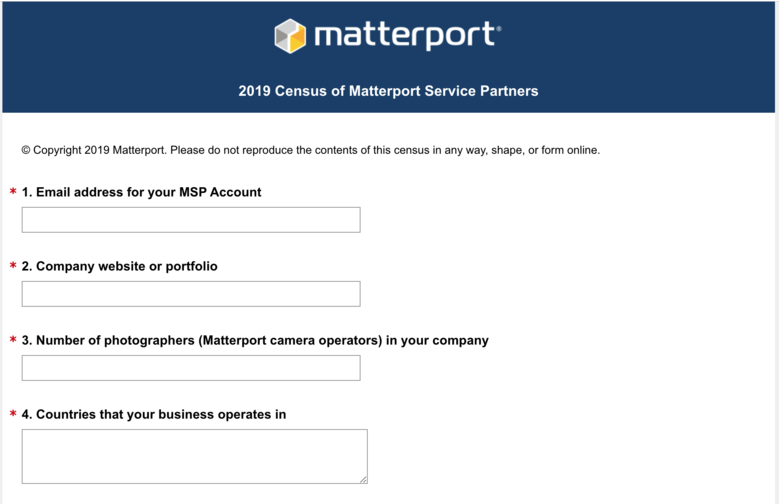 I think that it is at face value, a census being taken that will help someone at Matterport to start working on the next phase of the MSP Program. People complain about the unqualified leads being a waste of time. Matterport has paid money in advertising to get leads with no return. Maybe Matterport is going to pivot and provide qualified leads and stop the nonsense. If so, then someone at Matterport has to be able to qualify them and set pricing. I don't know how I feel about this to be honest. If there are 10 MSPs in my city and all of them want in, then how does one manage that? It would be better, in all honesty, to have no qualified leads, no unqualified leads, no MSPs and no MSP Program. People are always upset about something. I made up an expression once. Haven't successfully used it yet. Perhaps now is the time? People want Jesus to show up and fix all their problems. If Jesus showed up in church, they'd probably end up crucifying him again. At the end of the day Matterport is limited by the number of cameras they can sell and the actual scans derived from those. It is in their interest to get bulk contracts. It is in their interest to get the lowest price for said scanning. This is not directed to assist the single person contractor. I was not aware of this previously as they don't say that they are going to compete directly with us. Very few photographers would bother to buy such an expensive camera that is so limited in its use, if they knew Matterport was competing with them. I believe they are doing this already. If they truly cared about the individual they would lower their prices significantly to us so that we the individual could get significantly more business. Cloud hosting charges are not that great, they do not host the infrastructure themselves, most of there processes are automated. At the end of the day they are for profit and have no interest in a socially inclusive way of doing business. They want their profit and they want it now. They are not wolves, they are African Wild Dogs, highly efficient and ruthless predators. But hey, I like there camera and it makes pretty pictures. Matterport is a business with a large amount of investment capital that has yet to be repaid. As such, Matterport has a duty to itself, its employees (who have families too), the investors, the customers (both individuals and LARGE customers who purchase dozens of cameras). Matterport's duty is to keep the lights on for all of us. One way to do this is to make revenue. Revenue is made from cloud hosting. They have successfully created a product that has demand at a consumer price point. There are thousands of opportunities out there. Is Matterport competing with their customers? It depends on if their customers are the ones that you want. Chances are, you are not courting nationwide commercial real estate brokers or multi-family management companies. Therefore, they are not competing with you. Did Matterport once try to sell scans to Realtors in San Francisco? Yes. They were trying to leverage their marketing potential to create jobs for MSPs at rates that the initial pilot program MSPs thought was scalable and reasonable for exponential growth. What happened? They cared about the public response, as did the MSPs who were involved. It was unpopular, we move on. The cost of Matterport's cloud hosting is peanuts in comparison to the revenue that you should be making if you are successful at running your business. The camera itself is now down to $3,000. Considering the fact that you can easily make that money back in less than 10 shoots, I would say that it's an outstanding product. You can now use a Theta or an Insta360 ONE! Talk about low price of entry -- Matterport have MASSIVELY lowered their prices. Consider that you are not their only customer type. Matterport sell cameras to the same companies who own FARO and Leica Scanners for their own field work. Matterport sell cameras to large marketing firms like Co-Star, Abodo, Vacasa, etc. Matterport sell cameras to Realtors and Brokers. And Matterport sell cameras to you. It's a consumer product that everyone is welcome to purchase. You will see more and more agencies try to build nationwide networks of MSPs who will be paid low amounts. It's just normal. We are no longer early adopters in a new technology. There's a market demand and Matterport's sales team is just one of many large companies who want to offer Matterport tours in a nationwide manner. 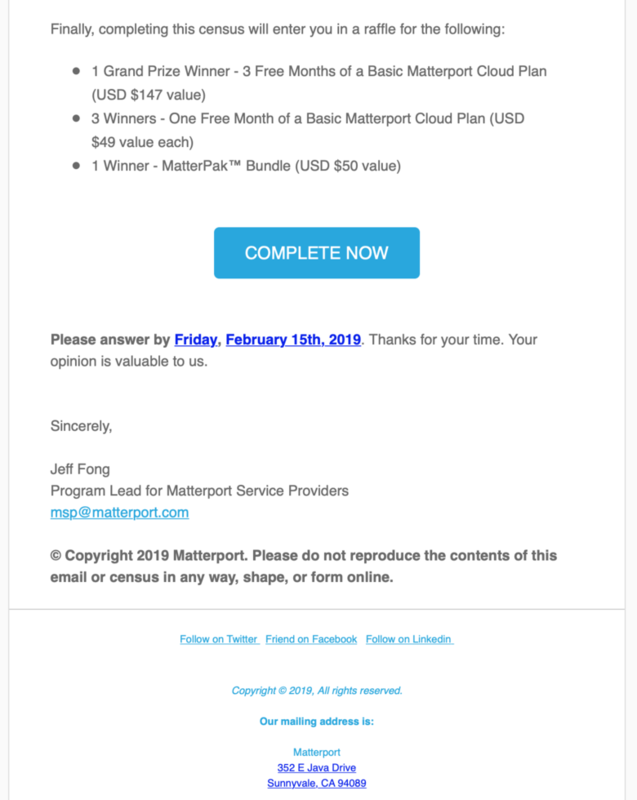 Is Matterport a Service Company or is Matterport a Software Company? The Matterport Service company wants to sell scans plus extras and someday it will also set the prices for these services. The Matterport Service Company will actively compete with the MSPs and other Service Providers (Photographers, AEC, etc) on a global scale. For an MSP there will not be much left to negotiate with his clients, because the standard scan prices will be set by Matterport. As a Service Company Matterport will be pitching the large scan volumes. This MSP survey is heading in this direction. On the other hand the Matterport Software (and camera) company, which grows with an unbeatable product and a portfolio of extra services. It mainly focuses on software development and service innovations. 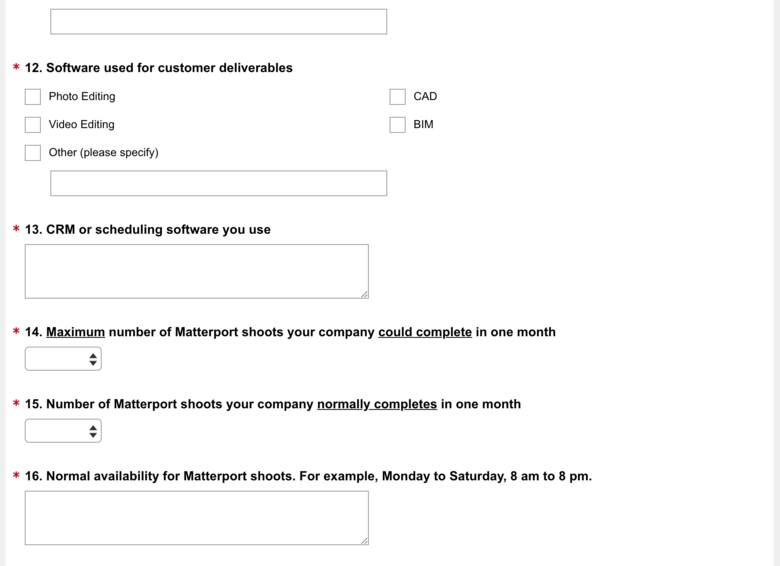 The software company grows with the network of MSPs who buy the camera and sell Matterports services. Among MSPs there can be large aggregators like Meero, who do the bulk selling. But you will probably never see any market intervention from the Software Company, because the Matterport Software company is only competing with the other Software and camera companies like nctech, cupix, geocv, etc. My opinion: I doubt that Matterport can be a successful Service company. Because if Matterport looses the MSPs, who should then make the cheap scans for them? Therefore I am so upset with this survey. I would like to see that Matterport focuses on Software development again. There is so many possibilities and there is still so much on the to-do-list. Chris I defer to your infinite wisdom and better business sense, if I had only understood their business model as well as you do. @Metroplex360 if Matterport existed the business of booking Matterport Service Providers, seems like that would encourage other agencies - and even individual MSPs - to get in the business of one order for many markets. ✓ Is Matterport a Service Company or is Matterport a Software Company? People will book you with Matterports MSP program, because this program will also deliver the complete pricing information in your market. Always in USD/Sqft. And the cheapest MSP will always win. This is active dumping. Your existing business contacts will renegotiate rates, because they receive complete price transparency directly from your partner Matterport. And you know, what the worst thing is about it? You have no chance, you must deliver those rates and pricing information. Because if you do not, you will probably be eliminated from competition. Future competition will take place in this Matterport MSP Pricing Program, which will be the central booking tool for everyone asking for Matterport spaces or for everyone who is interested in pricing information. Thanks for your insight and thoughtful analysis on the Matterport survey asking for pricing. Moving this discussion to the top of the WGAN Forum.